Soak the skewers in water for at least 30 minutes before grilling. This will help prevent them from completely burning up on the grill. Cut the vegetables into chunks roughly the width of the beef pieces. Taking care not to poke yourself, thread the meat and vegetables onto double bamboo skewers. One way to do this safely is to put the piece that you are trying to pierce on a cutting board, and then push the skewers through the piece to the board. 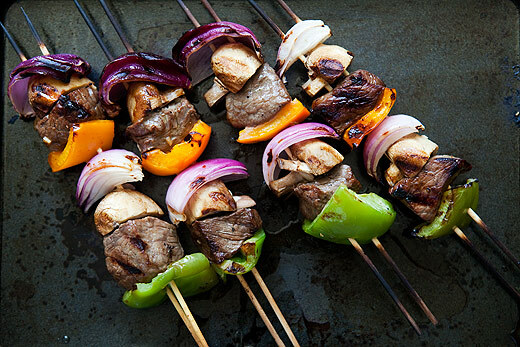 Using double skewers will help you turn the kebabs on the grill. If you keep a little space between the pieces, they will grill more evenly. Paint the kebabs with some of the remaining marinade. Prepare your grill for high, direct heat. Grill for 8 to 10 minutes, depending on how hot your grill is, and how done you would like your meat, turning occasionally. Let rest for 5 minutes before serving.